My first book was published by Prakash Books in February 2011. It is a travelogue about my solo three-month sojourn in the Himalayas. UPDATE: Photos are now published: Click here. Worth Every Gasp is the unique perspective of an Indian woman trekking alone through the Western Himalayas. The author sets out on a trek in Ladakh accompanied by her husband and a couple of friends. This trek is aborted when she develops pulmonary oedema, a potentially fatal form of high altitude sickness. Largely undaunted by this inauspicious start, Anamika bids farewell to her companions and embarks on a series of treks in Ladakh, Himachal, and Uttaranchal. She is accompanied, chaperoned, and sometimes bullied by her loyal guide Ballu, who often passes for her husband. As she meanders through the remote mountains, broad valleys, tiny villages, and high passes of the Himalayas Anamika comes face to face with wide range of landscapes, people, and improbable situations. She navigates through it all with the grace and elegance of an elephant on a dance floor, and emerges largely unscathed… apart from an irreparable scar on her reputation. My book was reviewed by Tehelka, and LiveMint did an interview of the author and a brief excerpt. I stumbled across a very nice review on somebody’s blog. And my friend Supriya reviewed it on her blog as well. Looks interesting? You can order it online from the publisher’s website, uread.com, or from a whole host of other online bookstores, including Crossword and Flipkart. Some places deliver to many countries. CENTRAL NEWS AGENCY PVT. LTD.
GAURA BOOKS INDIA PVT. LTD. If you’ve already read the book and want to leave some feedback, go right ahead. Good, bad, or ugly, I’m waiting for it! I completed the book yesterday and I thought I will let you know what I felt reading it. This is just my feel and does not qualify as any review. As you know I am nowhere near a critic or a reviewer. 3. The book was too factual and very less dramatisation. May be you meant it that way. There were moments of dramatisation like when Amit, Sridhar and Sowmya decided to leave you and in the end you and Ballu departed. I feel a stroy should have some dramatic elements to evoke the emotions of the reader and identify with whats happening. 5. I missed a story line and emphasis on personal element . You suffering from Pulmonary Odema and got bed ridden and then you decided to trek for months alone. You could have added personal dilemna and feelings which you went through (which were there as a factual representation). It could have said what it all meant to you as a person. As a reader I can identify more with emotions. All in all a great start and I hope to read more of youtr printed works. Great Read…Very funny & witty!! A must read. Read the book and wanted to let you know immediately that I thoroughly enjoyed it! And I would absolutely pick up future travel-adventure stories of yours. You have a flair for that genre. I’ll save most of my comments for the book meet, but in a nutshell – the book is well-written, has great descriptions, and reflects your humourous and down-to-earth approach. Worth Every Gasp- Worth a shot. 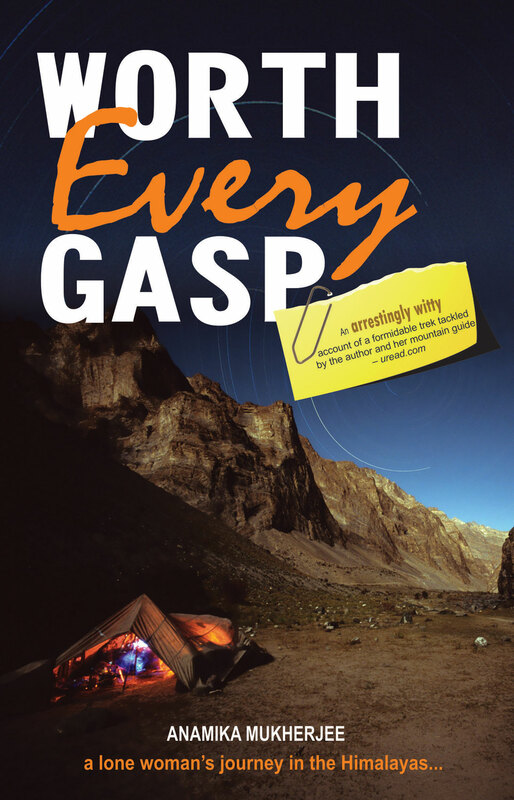 Anamika Mukherjee’s “Worth every Gasp” is a refreshing journey that you would love to embark upon. Being a trekking freak, you expect her to describe the experiences she faced during her long trips. But this work has some extra elements in it which has made it much more interesting and lovable. Not only has she described the beauty and never ending charm of The great Himalayas, she has also mentioned about her ordeals, the life threatening problem she went through and how she fought against it and went on a long journey with an unknown person without her husband who also is a trekker by profession. The upper regions of Himachal Pradesh, The Leh-Ladakh area have been very beautifully described. At no point, you find this work boring or even slow. She has also mentioned about the rituals that still exist in our society in comparison to more advanced western society. Overall, a fantastic work by Anamika Mukherjee! Do give a shot and you will get to know about a lone women’s journey which proves to be a life changing one. Loved the book Anamika. You were right. Once I picked it up – I couldn’t put it down – and I am not a person who reads (and hence likes) travel books. The book has fantastic descriptions that make it easy to visualize both the beauty and the starkness of Himalayas. The humor and simple, straight-forward writing style – make it a thoroughly enjoyable read. I am just too impatient to wait to finish the book to respond. Good starting. And I must appreciate your and not only yours, but also your husband’s courage to be at ease with your travelling alone. In the next addition please put some pictures also. I wouldn’t have hesitated to spend double the amount on the book with pictures. Will get bk once again after finishing the book. i enjoyed the book. I feel like i was there with u throughout the journey. Hi Latha, glad to know you liked the book.